The Maryland Campaign, or the Antietam Campaign (September 4–20, 1862) is widely considered one of the major turning points of the American Civil War. Confederate Gen. Robert E. Lee's first invasion of the North was repulsed by Maj. Gen. George B. McClellan and the Army of the Potomac, who moved to intercept Lee and his Army of Northern Virginia and eventually attacked it near Sharpsburg, Maryland. The resulting Battle of Antietam was the bloodiest single-day battle in American history. There were secondary reasons as well. The Confederate invasion might be able to incite an uprising in Maryland, especially given that it was a slave-holding state and many of its citizens held a sympathetic stance toward the South. 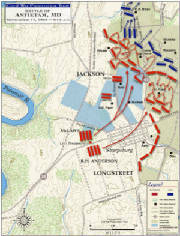 Some Confederate politicians, including Jefferson Davis, believed the prospect of foreign recognition for the Confederacy would be made stronger by a military victory on Northern soil, but there is no evidence that Lee thought the South should base its military plans on this possibility. Nevertheless, the news of the victory at Second Bull Run and the start of Lee's invasion caused considerable diplomatic activity between the Confederate States and France and England. While Stonewall Jackson surrounded, bombarded, and captured Harpers Ferry (September 12–15), McClellan's army of 84,000 men attempted to move quickly through the South Mountain passes that separated him from Lee. 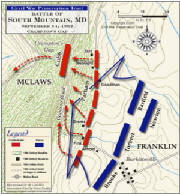 The Battle of South Mountain on September 14 delayed McClellan's advance and allowed Lee sufficient time to concentrate most of his army at Sharpsburg, Maryland. The Battle of Antietam (or Sharpsburg) on September 17 was the bloodiest day in American military history with over 22,000 casualties. While Lee, outnumbered two to one, moved his defensive forces to parry each offensive blow, McClellan never deployed all of the reserves of his army to capitalize on localized successes and destroy the Confederates. On September 18, Lee ordered a withdrawal across the Potomac and on September 19 and September 20, fights with Lee's rear guard at Shepherdstown ended the campaign. Although Antietam was a tactical draw, Lee's Maryland Campaign failed to achieve its objectives. President Abraham Lincoln used this Union victory as the justification for announcing his Emancipation Proclamation, which effectively ended any threat of European support for the Confederacy. 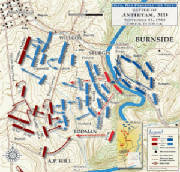 Battle of Antietam - 6:45 a.m. to 7:30 a.m.
Learning that the garrison at Harpers Ferry had not retreated after his incursion into Maryland, Lee decided to surround the force and capture it. He divided his army into four columns, three of which converged upon and invested Harpers Ferry. On September 15, after Confederate artillery was placed on the heights overlooking the town, Union commander Col. Miles surrendered the garrison of more than 12,000. Miles was mortally wounded by a last salvo fired from a battery on Loudoun Heights. 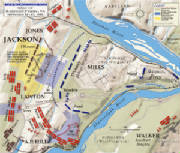 Jackson took possession of Harpers Ferry, then led most of his soldiers to join with Lee at Sharpsburg. After paroling the prisoners at Harpers Ferry, A.P. 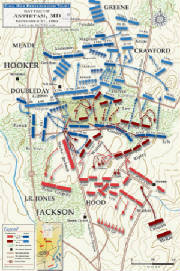 Hill’s division arrived in time to save Lee’s army from near-defeat at Sharpsburg. Battle of Antietam - 9:15 a.m.
After invading Maryland in September 1862, Gen. Robert E. Lee divided his army to march on and invest Harpers Ferry. The Army of the Potomac under Maj. Gen. George B. McClellan pursued the Confederates to Frederick, Maryland, then advanced on South Mountain. 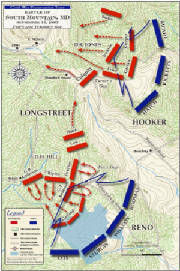 On September 14, pitched battles were fought for possession of the South Mountain passes: Crampton’s, Turner’s, and Fox’s Gaps. By dusk the Confederate defenders were driven back, suffering severe casualties, and McClellan was in position to destroy Lee’s army before it could reconcentrate. 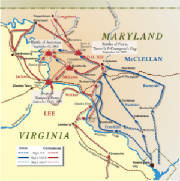 McClellan’s limited activity on September 15 after his victory at South Mountain, however, condemned the garrison at Harpers Ferry to capture and gave Lee time to unite his scattered divisions at Sharpsburg. Union general Jesse Reno and Confederate general Samuel Garland, Jr., were killed at South Mountain. Battle of Antietam - 10:00 a.m to 12:30 p.m.
Battle of Antietam - 1:00 p.m. to 5:30 p.m.
On September 19, a detachment of Porter's V Corps pushed across the river at Boteler's Ford, attacked the Confederate rearguard commanded by Brig. Gen. William Pendleton, and captured four guns. Early on the 20th, Porter pushed elements of two divisions across the Potomac to establish a bridgehead. Hill's division counterattacked while many of the Federals were crossing and nearly annihilated the 118th Pennsylvania (the "Corn Exchange" Regiment), inflicting 269 casualties. This rearguard action discouraged Federal pursuit. On November 7, President Lincoln relieved McClellan of command because of his failure to follow up Lee's retreating army. Maj. Gen. Ambrose Burnside rose to command the Union army.